My visit with Dr. Taha was very pleasant! I felt that she took her time during my visit and cared. Shewas able to address all of my concerns in a timely manner. My visit with Dr. Taha was very pleasant! I felt that she took her time during my visit and cared. She was able to address all of my concerns in atimely manner. Taha is an amazing doctor! Made me feel very comfortable, and did not rush my appointment with all my concerns Ihave. Dr.Taha was born and raised in Damascus,Syria. She obtained her medical degree from Damascus University which is the top medical school in Syria in 2008. 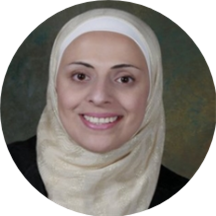 Dr.Taha then moved to Omaha, Nebraska and completed her family medicine residency at Creighton University, Omaha, NE in 2013. She then served at a community Health Center in Central Valley in California for 4 years and now joined Elite Medical Center. Dr. Taha received an Excellence In Care Award in 2014. Her medical interests include diabetes, hypertension, preventive medicine and women health. Dr. Taha is a board certified family physician. In addition to English, she is fluent in Arabic. I like Dr. Taha she was really nice and I think gave me good care answered all my questions. I had a pleasant visit. Dr. Taha is smart, kind, and attentive.